Congress has recessed for two weeks without passing a desperately-needed disaster relief bill. Why not? Because Senate Majority Leader Mitch McConnell didn't want to anger Donald Trump by adding money for Puerto Rico that Democrats have sought but Trump doesn't want. Recently McConnell used his Republican majority to cut the time for debating Trump's court appointees from 30 hours to two, thereby enabling Republicans to ram through even more Trump judges. In truth, McConnell doesn't give a fig about the Senate, or about democracy. He cares only about partisan wins. On the eve of the 2010 midterm elections he famously declared that his top priority was for Barack Obama "to be a one-term president." 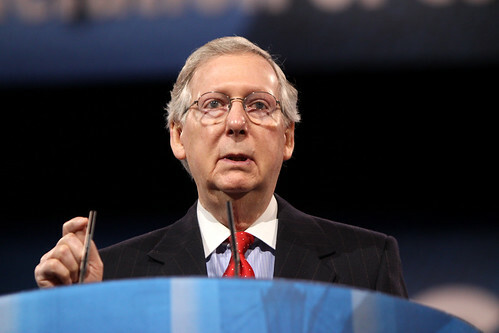 Between 2009 and 2013, McConnell's Senate Republicans blocked 79 Obama nominees. In the entire history of the United States until that point, only 68 presidential nominees had been blocked. In response, McConnell fumed that "breaking the rules to change the rules is un-American." If so, McConnell is about as un-American as they come. Once back in control of the Senate he buried Obama's nomination of Merrick Garland for the Supreme Court by refusing even to hold hearings. Then, in 2017, McConnell and his Republicans changed the rules again, ending the use of the filibuster even for Supreme Court nominees and clearing the way for Senate confirmation of Trump's Neil Gorsuch and Brett Kavanaugh. To Abraham Lincoln, democracy was a covenant linking past and future. Political institutions, in his view, were "the legacy bequeathed to us." On the eve of the Senate's final vote on repealing the Affordable Care Act in July 2017, the late John McCain returned to Washington from his home in Arizona, where he was being treated for brain cancer, to cast the deciding vote against repeal. Knowing he would be criticized by other Republicans, McCain noted that over his career he had known senators who seriously disagreed with each other but nonetheless understood "they had an obligation to work collaboratively to ensure the Senate discharged its constitutional responsibilities effectively." "But McConnell's long game is destroying the Senate." McConnell's long game is destroying AMERICA.